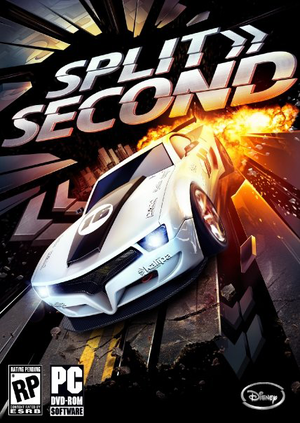 Released as Split/Second: Velocity in the United Kingdom. Frame rate is capped at 30 FPS. Use Split/Second 60 FPS Patch. The patch requires you to remove DRM from your copy as it does not work with Steam DRM. The DLC packs are only available on consoles. 2x SSAA is enabled at very high settings. No individual option. Use Split/Second 60 FPS Patch. Navigating menus and pausing may not be supported on DirectInput controllers. Bugged in split screen mode. Hooks the game as generic controller. Cursor is never shown in the game. Game pauses when not on focus. Player two must be using a (real or emulated) Xbox 360 Controller. 8 Official multiplayer servers have been shut down. ↑ 1.0 1.1 File/folder structure within this directory reflects the path(s) listed for Windows and/or Steam game data (use Wine regedit to access Windows registry paths). Games with Steam Cloud support may store data in ~/.steam/steam/userdata/<user-id>/297860/ in addition to or instead of this directory. The app ID (297860) may differ in some cases. Treat backslashes as forward slashes. See the glossary page for details.